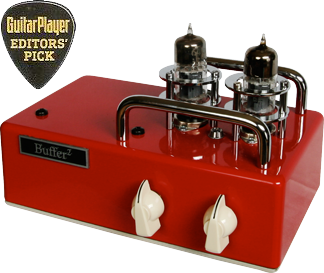 I built this Buffer2 because I’m a POD fan. I wanted a bit more tube “organics” and sustain. Frankly this buffer will work with anyone who uses pedals in their signal chain. You can use it before or after the pedals. Since it has low impedence output, you can also use it for home recording ANY musical instrument. The essence of the circuitry: 2-channels, Stereo volume and tone controls. Single input and output for each channel. All point-to-point, hand-wired. NO CIRCUIT BOARDS. NOS Allen Bradley resistors, Wima and Mallory capacitors. Teflon-coated silver wire. Sturdy and dense cast-aluminum chassis that also is impervious to RF noise. Internal power supply (no wall-warts!). Highly filtered plate and filament supplies makes for very quiet operation. The 1st stage of the 12AU7 is a low-gain amplifier. The 2nd stage is the buffer stage (low impedence). The LED has an inverted cone design that disperses the light 180 degrees around it’s circumference. Turn your lights out! and you’ll see how it illuminates the fins, shields and chrome grab bars. Jeff’s life-long career in music has encompassed performing, composing, arranging, producing, singing and songwriting. Jeff played guitar with Hall & Oates for two years, touring all over the world and played on recordings including the solo on “Kiss On My List”. He played with many other artists including Laura Branigan, Graham Nash & Dan Hartman. His songs have appeared in John Sayles’ movies, “Brother From Another Planet” and “Lianna”. Patti Austin recorded Jeff’s song “Good in Love”, on her Love is Gonna Getcha CD and over 40 songs have appeared on daytime television shows, including Scotti Brothers’ release of “Together Forever” from As The World Turns. Jeff’s Clio winning television and radio work includes writing, arranging, and producing for Whitney Houston, Aretha Franklin, Wynonna Judd, Ray Charles, Aaron Neville, Leann Rimes and Steve Harwell (Smashmouth). Currently he’s been writing and producing original music for the hit PBS children’s show Dragontales. Jeff continues to explore and expand his capabilities from live roots rock, jazz, country, new age and pop to the cutting edge of digital audio technology and computer music.